Week one of culinary school is officially behind me. In only four classes we covered knife skills, taillage, tournage (turning vegetables into cocottes and other maddening seven-sided football shapes that I am pretty sure are going to give me carpal tunnel), ServSafe and all the many ways I can kill you if I don’t handle food properly, cooking a l’anglaise and a l’etuvee, ratatouille, timbales, and a vegetable dish made up almost entirely of cocottes. At least, it was supposed to be made up entirely of cocottes. I have a long way to go before those seven sides come out evenly. It was an exciting if not slightly frenetic week and though I am not yet working during the day, I was grateful for this past weekend to catch my breath, find my footing and prepare for this week’s lessons. 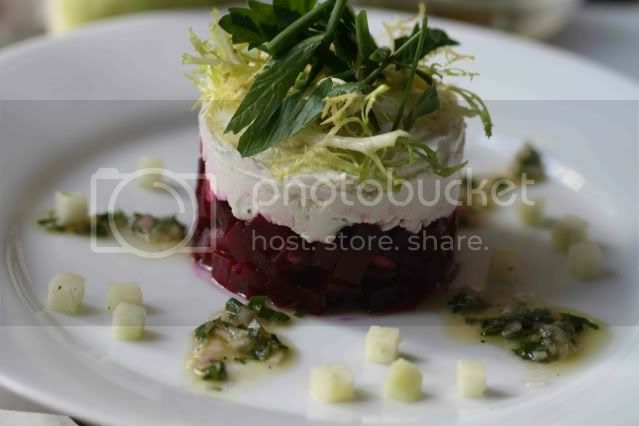 A roasted beet timbale was the most attractive dish we made last week. For that reason, and because of its surprisingly simple preparation, I recreated the dish at home to share with you here. Well, those reasons and I snagged the extra roasted beets from class. Aside from the precarious beet juggling it took to get them home on the subway without a bag, I was thrilled. Extra beets meant I could make this timbale for you without even turning on my oven. At the risk of beating a dead horse I must say, the idea of turning on my oven for anything is still a bit off-putting. Once your beets are roasted (or donated by a generous culinary school instructor), this salad is just a few simple steps of chopping, mixing and stacking. It looks slightly intimidating because of its lovely composition, but trust me, this is simple stuff. I did not even look at the recipe the second time I made it. In a few hours I am off to school for lesson five – stock night. I have made my fair share of chicken and vegetable stocks so I am hoping for a beef or veal stock assignment. Though I am not sure we will even make those in class this evening as they need to simmer for longer than the five hours we have available. Perhaps we will set them to simmer overnight and tomorrow’s day class will take it from there. Peel the beets and cut into a small dice (to be exact, we cut them into a shape called macedoine which is a 1/2 cm x 1/2 cm cube). Place the chopped shallots in a small bowl and add the vinegar and a sprinkling of kosher salt. While whisking, slowly pour in the olive oil. Add the tarragon leaves and adjust the seasoning. 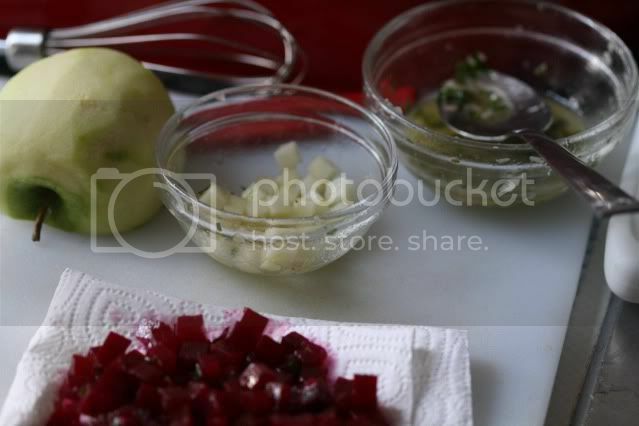 Use a few spoonfuls of vinaigrette to dress the beets and set aside. Peel the apple and cut into a small dice (again a macedoine if you want to be exact). Dress the apple with a bit of vinaigrette to slow oxidization and set aside. Bring the goat cheese to room temperature. 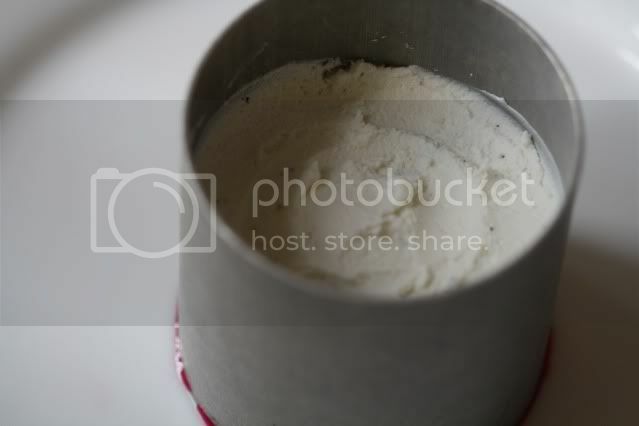 In a small bowl, work the goat cheese until it is spreadable and season with salt and pepper. Blot the beets with a paper towel to remove any excess liquid. Place a 3-inch ring mold on a plate and put the beets in the mold, pressing down slightly to create an even layer. Top with the goat cheese, smoothing the top so it is flush with the mold (my ring mold was too tall so the goat cheese was not flush with the top of the mold). Gently remove the ring mold. In a separate bowl, mix together the herbs and frisee and season with salt and pepper. Add olive oil to lightly coat the leaves. Top the goat cheese with the small herb salad. Place some of the apples around the plate and spoon the vinaigrette over the plate in a decorative manner. Note – you may have some leftover vinaigrette, salad and apple. Do not feel as though you have to fit it all on the plate. Toss them together and enjoy separately from the timbale. Looks gorgeous! What did you ever do with all of those carrots? What a stunning dish! I'm so glad that I found your blog...thank you for commenting on mine. One of my dreams is to attend culinary school, so I'm going to have to live vicariously through you! I can only imagine how impressed my family would be if I made this beet dish at our next family dinner! This look so elegant and delicious. Also, can't wait to hear more about your culinary school adventures. Just wanted to come over and check out your site- its lovely! Nice work on the photos. May I ask where it is you are attending Culinary School? Saint Tigerlily - So far I have just dressed them with a little olive oil and salt and eaten them as a salad. I love carrot soup, but it is still too hot for soup (as you know!). Any other ideas for me? Cheriepicked - I'm at the French Culinary Institute in New York. Very, very happy with it so far! This sounds lovely. I have some beetroot in the garden so I might have to give this a try. Thanks for stopping by my blog! This dish looks amazing, certainly a showstopper when entertaining. Thanks for sharing! Jessica, this is a beautiful salad. I am looking forward to following your adventures at FCI! These look beautiful. I don't have that tool for stacking but I love the color and these seem reasonably easy so I may have to investigate.